Today while I was in the basement looking for our galvanized bucket to put a few mums in, I found my roll of burlap lying on the floor. (It must have dropped out of one of the boxes Mr. R was moving around.) The burlap got me thinking, so I poked around the Internet for a few ideas of what to do with it. I saw several projects where the burlap was threaded onto some wire to make a wreath. It was after I started threading the burlap the first time that I realized there wasn't going to be enough to go all the way around. That's when I got the idea to incorporate the pumpkin garland which, to this point, was in the living room above two pictures. Guess I will be buying more of that pumpkin garland. This wreath is super simple to make. All you need is 3 inch wide burlap, some pumpkin garland (I used two strands of garland) and a wire clothes hanger. Straighten out the wire hanger and then thread the burlap onto the wire in an alternating fashion, folding the burlap back onto itself. Every few inches wrap the pumpkin garland onto the wire in between the burlap. Then just make a loop with each end of the wire and hook the two together to close the circle. Now isn't this the most ironic thing??? What was lying on the basement floor this morning is now hanging on my front door this afternoon! You just never know where inspiration is going to come from next!! I hope you are all enjoying a beautiful September day! Update...I received a few notes asking me where I purchased the 3 inch burlap. I bought it at Michael's craft store last spring. I am sure they still have tons of it given the burlap craze right now. Oh, Wow, Barbara! That sounds so simple for such a good looking wreath! I love the rustic look of it. The little fall berries add a lot. I'm making burlap wreaths for a Fall Crafts Festival in Oct. I love the fall berries. Awesome wreath! I've got to buy more burlap! Barbara, what a cute idea! And you made it sound so easy!! Love the addition of the garland to the burlap! I love-love your wreath! I want to make one too. Where do you buy the wide burlap? I love it! It came out so well and the pumpkin garland is perfect! You ARE creative! It's darling...love, love, love! The amazing thing is that even I might be able to pull that one off! LOL! This is such a beautiful autumn wreath idea, Barbara--I love it and pinned it! Beautiful inspiration! Thank you fro sharing your project at Potpourri Friday! This is so rustic and beautiful and so perfectly autumn. I love it! 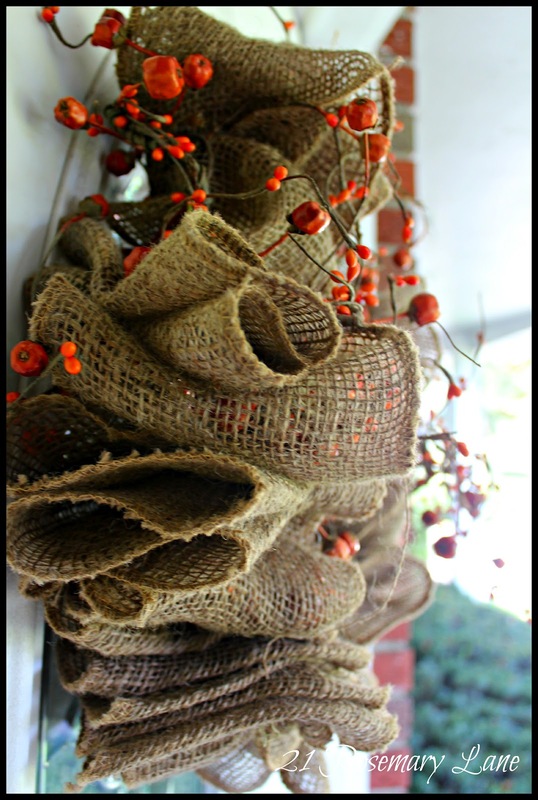 Love your burlap wreath, so easy just so stunning. Wow! 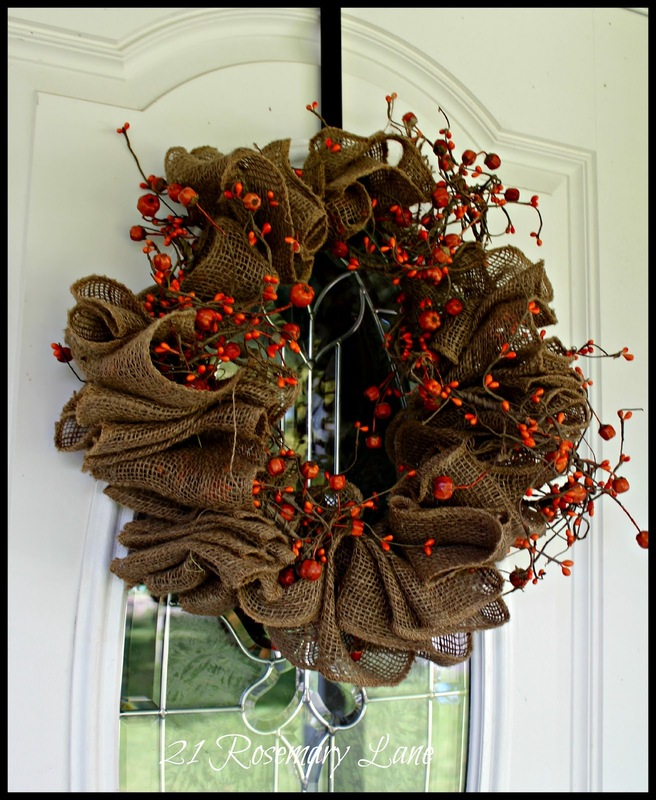 This wreath is so rustic and lovely! 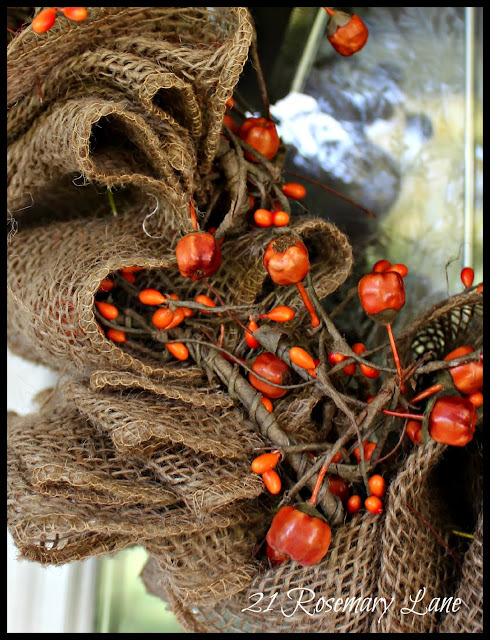 Burlap is so great and the berries look wonderful with it. I found you through 2805's linky party and I'm your newest GFC follower. Hope you can stop by for a visit sometime and follow back. Have a great weekend! Love the combination of color and texture. Screams fall! I'm in love with your wreath! I think it's simple enough that even I can make it. Thanks for the inspiration. I love that burlap ribbon! It is great for making burlap ruffles too! I made a pillow with a ruffle out of it, simply yummy stuff! I adore your wreath~ it turned out so charming! Thank you for sharing at Feathered Nest Friday! Love it, love, love, love it. Sounds like a quick, easy and gorgeous one to make. 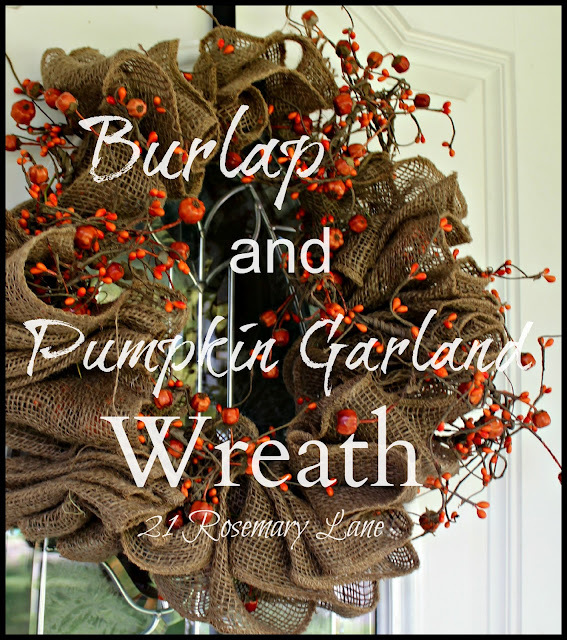 I've always got burlap in the home, and the pumpkin garland is adorable! Thanks for sharing your inspiration with Sunday’s Best – you helped make the party a success! This is just darling... I have some burlap lying on my basement floor too! I got mine at the feed store though. They sell it there for planting projects...I'd love for you to share it with my readers on my Farmgirl Friday blog hop this week! It's be up tomorrow evening! Everything's coming up "burlap" these days, and it's so much fun & cheap to use. 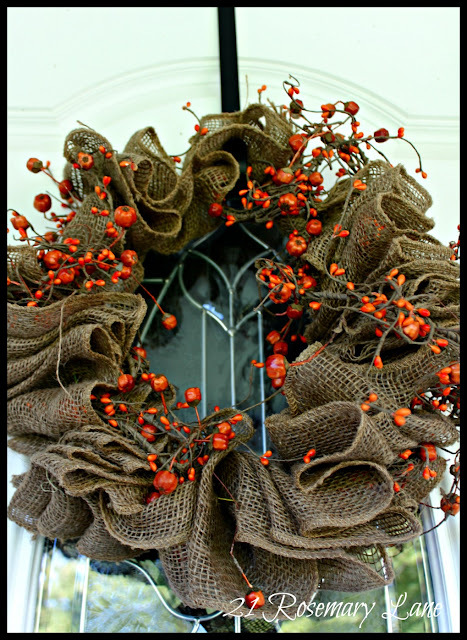 Love your wreath & the punch of color from the berry garland! This is beautiful! I've pinned it to my pinterest!